Every day, at just about every event that could be of interest to the national and international media, there is at least one Getty photographer, snapping away, all the while knowing that countless websites, Facebook posts, Tweets, and Tumblr posts will probably soon be sharing some of these pics without paying or providing any credit. But after years of trying to combat photo thieves, the mammoth photo agency realizes there is no use fighting the trend. In a if-you-can’t-beat-em-join-em effort, Getty is now giving non-paying users the option of embedding its photos (for non-commercial purposes) without having to pay a fee. Until now, if you really wanted to share some photo of, say… Beyonce at the Grammy Awards. You could have sifted through the images, but the only way to get a non-watermarked pic was to either set up an account with Getty and pay, or just wait for someone to post it and then right-click-save it for your own purposes. Now when you select an image, you’re given the option of embedding it at a decent web-ready size (sorry, magazine editors looking for free 300 dpi pics). So how in the world is Getty planning on making any money off this? By taking advantage of the fact that an embed code can be used to do revenue-generating things like inserting ads or good old-fashioned data mining. The company isn’t doing either of those things at the outset, but the exec says they’re probably in the offing. 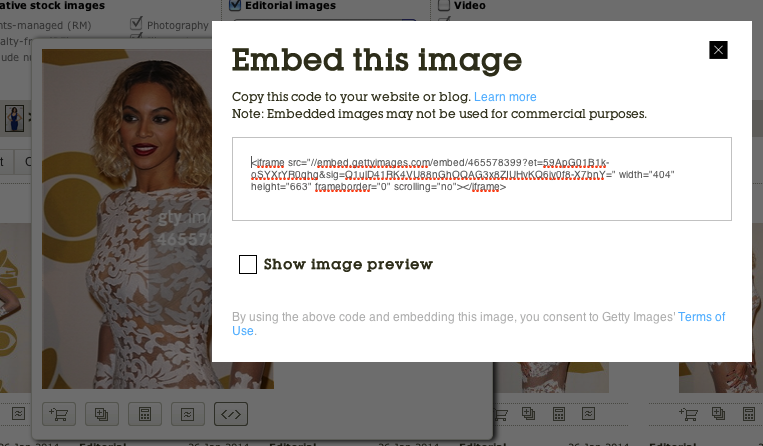 As The Verge wisely points out, using embed codes for images instead of uploading files directly to sites and social media accounts gives Getty (and other agencies that may follow suit) the ability to block, edit, or remove images.